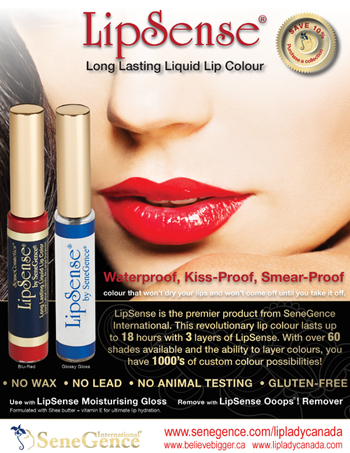 LipSense is the premier product of SeneGence International and is unlike any conventional lipstick, stain or colour. As the original long-lasting lipstick, it is waterproof, does not kiss-off, smear-off, rub-off or budge-off! Create your own color palette by combining colors from over 50 shades + limited edition lipstick colours. LipSense is an amazing departure from conventional lipsticks and comes in a wide variety of shades and textures. LipSense is a unique product that does not dry out your lips. In fact, LipSense helps to restore the moisture content of your lips when used properly. LipSense Liquid Lip Color can last anywhere between 4 and 18 hours. Create your own color palette by combining shades. Three LipSense will provide 27 different custom lipstick variations! Your customized look will last even longer and your lips will stay moist and plump with LipSense Moisturizing Glossy Gloss. There is also a matte gloss as well as 13 other lip glosses that can be worn alone or in combination with LipSense. LipSense is initially sold as a set, which includes LipSense Liquid Lip Color, a moisturizing Gloss, and an Ooops! Remover. Yes it is required to use our own gloss and the Ooops! remover is a necessary product in case you need to correct a mistake and to remove it easily. We also offer a moisturizing Lip Balm and LinerSense, to enhance and perfect your lip look. Smooth on any texture of LipSense® Gloss to add rich moisture to lips, either on top of LipSense® Liquid Lip Color, or on bare lips. Gloss also helps to seal in LipSense® Lip Color and improve the longevity of the color. Contains shea butter and vitamin E to nourish, condition and soothe lips. Available in a wide variety of glossy, matte, shimmer and pearl finishes. SeneGence Customers enjoy the benefit of guaranteed products with patented and proprietary technologies. Our revolutionary skin care and cosmetics lines have evolved and recognized as the highest quality and most effective state-of-the-art products available to buy or sell on the market today. We are blessed with a global economy that permits us to partner with people all over the world. Our products are manufactured in the US and our Canadian Warehouse is in British Columbia. We are physically located in Barrie, Ontario Canada, Just 1 hour north of Toronto Canada. You can also join our team from Mexico, New Zealand, Australia, the United States and Canada of course. Here is the link to sign up with our team today! We are Team WONDER-WOMEN!! Click here to join Distributor ID #396200 will link you directly into our team and team leader NANCY O'DONNELL. This WOW Video says it all! Shop for SeneGence Beauty Products including our SkinCare and Cosmetics in our online Flip Beauty Book! WHAT AN EXCITING PRODUCT AND EVEN MORE EXCITING COMPANY! It's easy to get started to become an independent SeneGence distributor. Sign up in minutes and immediately begin purchasing products at a discount of 20% - 50% off the retail price. Join us as an Independent Distributor and enjoy fantastic products that really work, and a career that really works to meet your unique needs and goals. Please do check back often as our site is currently in the development stages! Thanks again for visiting us. WE We service all of Canada but in particular Barrie, Simcoe County, Toronto, Ontario. THANK YOU!! For your FREE NO OBLIGATION CONSULTATION contact your LipSense Lip Lady Canada and her LipSense Wonder Women! We are part of Canada's Fastest Growing Team! Visit us on Facebook page or contact us at our email address. © 2019 Senegence LipSense Canada Distributor #396200, Barrie, Ontario Canada. Web Development & Hosting by ProFiles Digital Media Inc.